Elements of American rhetoric around the westward expansion often drew on the Bible—some people nicknamed California the “Land of Milk and Honey,” for instance, the Biblical moniker for the Promised Land. Something about the wide open spaces and promise of a bright, prosperous future put 19th century wagon-weary settlers in mind of the Old Testament, with its stories of the children of Israel headed across the wilderness and toward a place of plenty and promise, with fruit bigger (according to the book of Numbers) than anyone's wildest dreams. To the white settlers, at least, it promised hope, wholeness, fulfillment. It held all good things. A new start. American storytellers' fascination with the expanse west of the Mississippi has never really let up. But how we've imagined it has shifted over the years. Today, with the weight of history behind us, we don’t cast it a sort of Promised Land; the West we see on screen—not confined to the plains and the Rockies anymore—more often resembles a place of judgement than promise. Rarely is it a hopeful vista trod by the courageous. It’s a wasteland purgatory for the doomed and damned. Westerns have always been the backdrop for men with dark histories, of course. The cowboy rides into town, running from a secret or a shady past. Those stories were their stops on a redemption road, places to atone for one's sins. But though today's craggier, crueler landscape finds its archetype in the Bible as well, the land is trod by men who are not strong and silent heroes, but wanderers: not characters in pursuit of redemption, but characters pursued by a presence, tortured and possessed souls sure only that the universe is out to get them and kept alive only by some dogged mission they didn't choose themselves. And if he exists at all, the God of today's West more often fits most people's idea of a vengeful, capricious Old Testament God than a benevolent bestower of gifts. The father of all wanderers is Cain, who in the book of Genesis kills his brother Abel out of jealousy and then is condemned by God to a life as a fugitive away from his home, an echo of his parents' ejection from Eden. There's a sort of severe mercy in the punishment God metes out: when Cain protests that people will want to kill him whenever they meet him, God places on Cain a sign to protect him, swearing that those who mess with Cain mess with God. He goes on to build cities and raise sons. Today his name is synonymous with fratricide. The wanderer trope—a man without a home, with a seemingly futile mission he didn't choose—repeats through the Bible: Moses, for instance, after losing his temper and disobeying God, is left to lead the Hebrews in endless circles in the wilderness for forty years, in sight of the Promised Land, but he is never allowed to enter. Jonah tries to flee his distasteful mission—a charge to preach repentance to his enemies in Ninevah—by taking to the high seas, only to discover that you can't outrun God's plan when it involves a whale. Other prophets like Ezekiel act as loner performance artists, never permitted to lead a normal life, taking on great discomfort and performing weird stunts to bring some message to those who remain hard of heart. The entire nation is eventually led into exile, and most of them never return. Even Jesus himself lives into the type, albeit by choice, living his adult life as a homeless man headed for his death, an itinerant preacher whose imprecations fall largely on unbelieving ears. From Melville's whale-haunted Ahab onward, the same trope pops up throughout American literature. And of all living American storytellers, Cormac McCarthy has cornered the wanderer's tale; everyone else works in his shadow. His “Border Trilogy” trails latter-day cowboys John Grady Cole and Billy Parham, young men discovering that the American dream has let them down. Sheriff Bell warns that the U.S. is “no country for old men.” In “The Road,” a man and his young son, so disconnected from civilization that they no longer really have names, travel in search of safety—but the man is a consummate wanderer, aware that he's there to try to deliver a next generation to the future, if such a thing exists anymore. McCarthy imagines the West as a place where evil reigns, and good only occasionally breaks through the darkness once in a while—a peasant who cares for an injured cowboy, a cellar of stolen canned goods, the brief paradise opened up by newfound love. It never lasts, though. The 20th century destroys the promise of a plenteous future. In its place is the sense that history is a long arc toward tragedy, a vast nothingness in which darkness is all that is real. You might be trying to save your child or get your family's horses back or deliver bounty and secure your future, but you're destined to be the meal of a blood cult, or discover there's nothing of your heritage left to cherish, or become the victim of a random, senseless personification of evil toting a captive bolt pistol. It was hard to ignore the ring of McCarthy about Rust Cohle, the grizzled detective played by Matthew McConaughey in “True Detective”'s first season who speaks mostly in nihilistic aphorisms. Once an upstanding husband and father, Cohle's tragedies—his daughter's death, his marriage's dissolution—drives him toward a cold fixation on work. An unblinking investigator, seemingly emotionless and cynical, he seems driven by his demons toward a career as a self-styled sacrificial lamb, serving a cruel God. He lives in a spare room fit for an ascetic, beneath a crucifix, and he does not believe in goodness. Of course, the rural Louisiana setting for HBO's “True Detective” isn't exactly the wide-open plains of Wyoming or Montana. But it has the same godforsaken quality—a land abandoned by civilization to host man's basest, most disturbing instincts: greed, lust, sadistic destruction. At the show's start, Cohle and his partner Marty Hart find Dora Lange violated, mutilated, and wearing a crown of stag antlers—an animal which, not incidentally, is a medieval symbol for Christ. 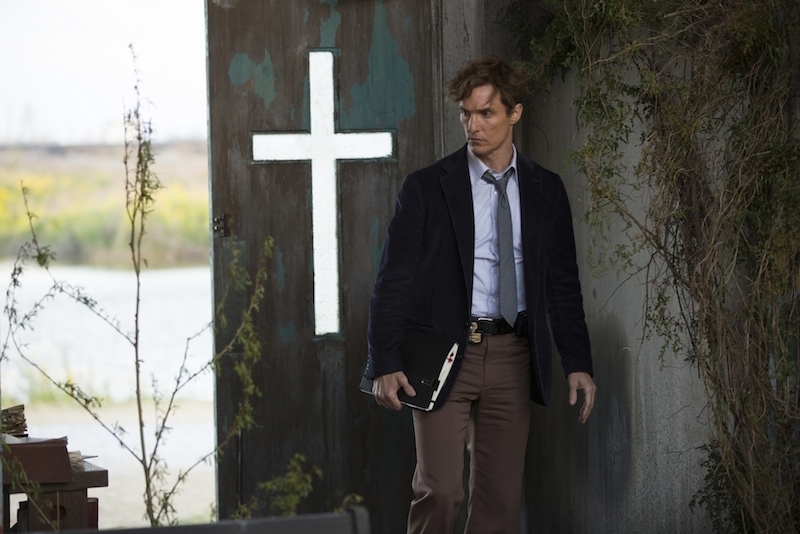 That violent motif (oddly enough) is repeated on "Hannibal" to finger Lecter as a sort of anti-Christ, and in “True Detective” it serves the same function: this is a land abandoned by God, and Cohle is the weary wandering savior of sorts. In the end, "True Detective" lets the light break through just a little, indicating something intriguing: the show's story might be about a moment of apocalypse, in which darkness gets so thick that it almost wipes everything out. But the show visually indicates in one key finale shot that Cohle-the-wanderer is a savior figure; if stories of apocalypse are about the end of one epoch and the beginning of a new one, then “True Detective” is a hopeful apocalypse. 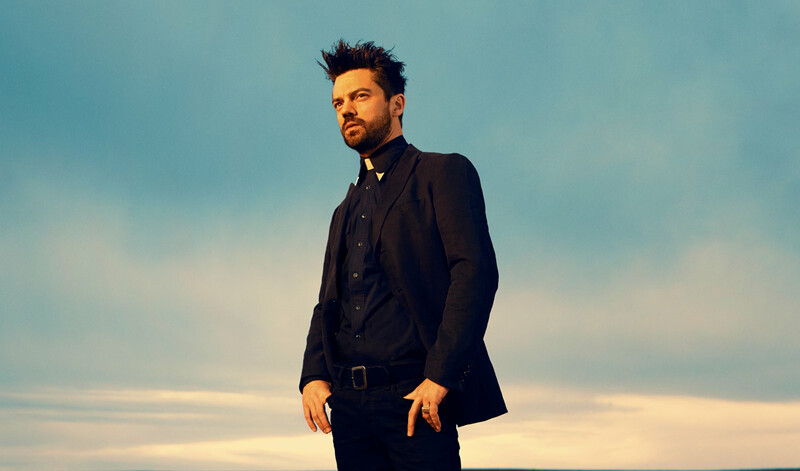 The AMC show “Preacher” is set in rural Annville, a tiny town in west Texas, a place on the edge of apocalypse. Jesse Custer's church is emptying out, trumped by the megachurch down the street that lures worshippers with an on-campus Starbucks. The town has lost faith and, with it, any real hope. It's a place no preacher should have to be, including Jesse's late father and, now, Jesse himself (who's an incredibly lousy preacher when the story begins). “Preacher” story is full of wanderers: Cassidy, for instance, the 119-year-old Irish vampire running to escape vampire hunters, as well as the men who are pursuing him (or are they?). (Early in the show we're also introduced to Odin Quincannon, the wealthy man who likes to chill out in his office by listening to recordings of the sounds made by slaughtered cows who, maybe significantly, shares a name with the Norse god who wandered among humans disguised as a character called “The Wanderer.”) The show backtracks on its source material—a series of comics by Garth Ennis and Steve Dillon—to introduce us to Jesse as he is suddenly possessed by a force far beyond his control, something evil and powerful that gives him the ability to command anyone in terms they find irresistable. The books tell us that Jesse and his pals will soon embark on a long, roaming mission across the West to locate God, who's abdicated his perch atop the pecking order, and tell him off. Surely someone's got to do that job, but boy howdy, it isn't one a man would choose—so naturally it's the man with a dark, violent past who gets set on that course, with his murderous ex-girlfriend and a sardonic alcoholic vampire for sidekicks. They are the consummate wanderers in the new American west. In the universe of “Preacher,” God is slowly revealed to be more or less ineffectual. Religion and goodness doesn't work anymore. Only power, violence, and the force supplying Jesse with his mysterious power can make things happen, which means all those things are more almighty than God. In turn, Jesse didn't invite the power—it grabbed and possessed him. He, and everyone else, goes where it takes him: "It feels like there's a big blender in my gut—and inside that blender, there's everything,” he says. “Love, hate, fire, ice, polonium, ice cream, tarantulas, everything. All of God's creation inside me." 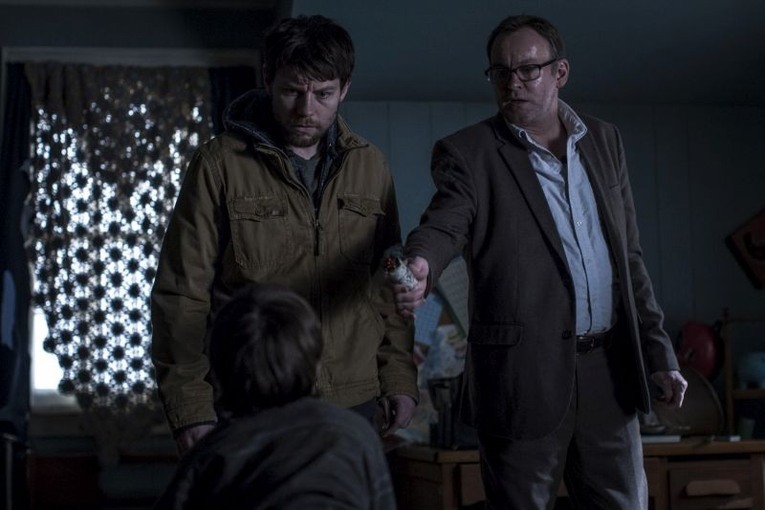 Where “Preacher” takes a darkly comic tone, Cinemax's “Outcast”—set in Rome, West Virginia and based on a series of comics by “Walking Dead” creator Robert Kirman—is full-on horror, a tale of demon possession in which the protagonist, Kyle Barnes, is being literally pursued. All his life, demons have taken the people close to him: his mother, his beloved wife, his young daughter. He is a hermit in his own home; his status as an “outcast” is all the more disturbing for happening in the place where he grew up, among people who knew him and his family. Like “Preacher,” “Outcast” also features a minister, Reverend Anderson, whose goal is to save the town by casting out demons. Anderson resembles Rust Cohle in some key ways: he lost his own family, and he's a hard-drinking man with a gambling addiction. Anderson teams up with Kyle, whom he quickly discover harbors a power similar to Jesse's—he can command beings, and they obey—but in his case the beings are demons, and they are pursuing Kyle for reasons he doesn't understand. The conversations between Anderson and Kyle weave them into a two-headed figure of wandering: Kyle, with a tortured past and memories, pursued by evil, and Anderson, driven by the recognition of that evil on a mission in this small town that has much broader ramifications across the whole country. They are men aware of their place at the end of some simpler time, a world that has enjoyed an abatement of evil's reign for a time but is coming up on something darker, as the demons warn them. It's another impending apocalypse. That all three of these shows dabble (or more) in the supernatural likely reflects their place in a TV landscape loaded with shows interested in religion, or the apocalypse, or both—and they're hardly the only ones: you could argue that Kevin Garvey on “The Leftovers” fits the wanderer bill, or Jon Snow in Westeros (hmm), or any number of characters in the post-apocalyptic wastelands of “The Walking Dead.” The wanderer is an apocalyptic figure, inscribed into an ancient archetype and dropped into a ruthless world haunted by evil. That so many are drawn onto bleak American landscapes that once promised bounty and a prosperous future belies a sort of cultural pessimism. And yet—and yet. Some wanderers live to see redemption. The prophets sometimes die horribly, but their messages live on. Wanderers aren't always forgotten, and they don't always lose. Rust Cohle claims at the end of “True Detective” that “once there was only dark; if you ask me, the light is winning.” So maybe it's not so much where the wanderer's story begins that matters. It's where it ends.